He started his pottery career in 1964 with a four year apprenticeship training under his father Ray Finch at Winchcombe Pottery. Whilst learning the more obvious skills such as throwing, glazing and firing, he developed a natural eye for strong, functional forms, and the flexibility to produce pots that people will both want and be able to afford. All these factors are still paramount in his work. 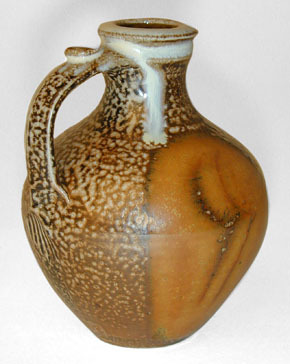 In 1968 he travelled to Africa where he was sponsored to establish Kolonyama Pottery, Lesotho’s first studio pottery. In 18 months, with Trudi’s help, a large oil fired kiln was built, blunger, filter-press, wheels, etc. installed. Clays are glazes tested, local staff trained and three major exhibitions held. During the Scottish winters of 1975 and 1977 they revisited Southern Africa and in 1979 spent three months in Australia. On each occasion they have pottery master-class demonstrations and ended their stay with an exhibition. In 1980 he was invited to co-manage the Dartington Pottery Training Workshop for six months. They moved to Wales in 1984 living first in New Radnor, Powys and then on to West Wales. Here in a workshop converted from a stone barn Joe first produced earthenware using an electric kiln. Having secured a supply of wood he redesigned and rebuilt his wood fired kiln and had returned to producing stoneware. Recently he has built a second chamber to the kiln and is ‘soda firing’ in it. Photographs: Top-left: 42cm handled jug; Top-right: Kiln firing; Bottom: 25cm salt-glaze jug.